As promised, a quick word about inflation linkers in emerging markets. While in most cases, the path of inflation in the coming 3-6 months is pretty much given; many economies are a completely different level of their respective inflation rates. Importantly, volatility of inflation rates also differs wildly. Take the following chart as and example. 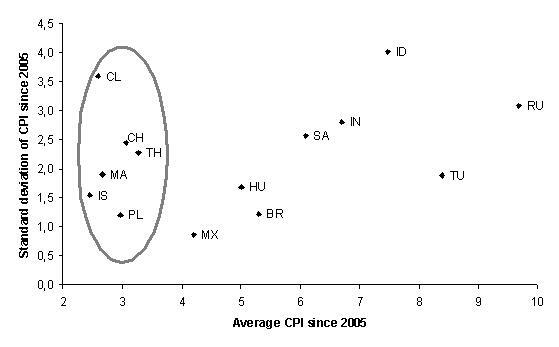 It shows the relationship between average inflation since the beginning of 2005 (so around 100 observations) and the standard deviation of CPI in the same time-frame. As you can see, there is a group of emerging economies which have achieved a relatively low level of inflation (the circled part of the chart) but they have had mixed success in terms of staying close to the average. Arguably, Israel, Malaysia and Poland are the best in this field. As you move to countries with higher average inflation rates, standard deviation tends to rise. However, note that we are talking here in percentage points, as opposed to normalised values. In other words, we say that Poland is “better” than Turkey just because it has had a lower average and a lower standard deviation. However, if you normalised standard deviation by dividing it by the average you will see that Turkey has been much closer to its average than Poland. We will use that in a minute. The chart below combines the approach of the volatility in inflation rates (i.e. standard deviation divided by the average) with the distance of the latest CPI print from respective central banks’ targets (note that for some countries I had to make assumptions as their central banks are not inflation targeters). In this chart we see, for example, that South Africa is 1.2pp above the 4.5% target (mid-point of the 3-6% SARB range) and that standard deviation of CPI prints since 2005 has been around 40% of the average (which was 6.1%). have experienced significant volatility of inflation prints in the past. In those economies you should consider looking at inflation linkers or shorting nominal bonds. 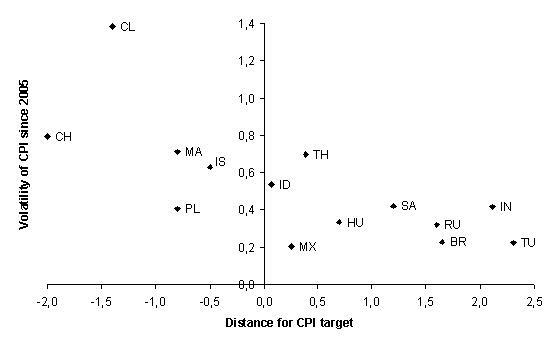 When using such a comparison, Chile stands out as a good candidate with low current inflation and high inflation volatility. Similarly, Israel has a history of quite rapid moves in inflation rates and we also can be reasonably sure that the output gap there is insignificant. Finally, Poland is looking at rapid declines in inflation rates at the moment, mathematically increasing odds of a rebound in the second half of the year and indeed in 2014. There are also many caveats to this approach but I have found it to be a useful starting point when trying to play a global inflation / disinflation theme. Econbrowser ran a post entitled “Dude, where’s my cheap gas?“. It has a few interesting charts indicating that it will take some time before the shale gas/oil revolution impacts prices at the pumps. I think there could be a bit more into that story and quite soon, too. 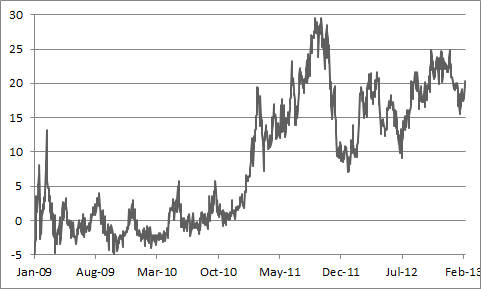 The chart below shows the spread between Brent and WTI oil prices. This has stayed elevated for quite some time and for various reasons and it seems to me that the market is no longer paying attention to why this is actually happening. Many have been citing he Middle East turmoil as one of the reasons. While this is certainly a factor, why would we see that only in Brent prices? Firstly, Brent and the Middle East blend are not exactly substitutes. Secondly, we are not seeing that risk in any other market (have a look at the Israeli shekel or forward points in USD/SAR in Saudi Arabia). Finally, there is tons of new supply coming from Iraq and some African nations, replacing the lost output from Iran. In short, I don’t find the whole Middle East hypothesis plausible. So if it’s not supply disruptions/changes then maybe it’s demand? If you go through the Chinese data (and seasonally adjust them), you will find that the dynamics is pretty decent. Moreover, for years everyone has been talking about Chinese urbanisation, which inevitably brings more demand for fuels (think of it as the copper-oil spread). We can’t be certain how far advanced in the process we are but things are progressing in the direction of less investments and more consumption. Meanwhile, the world is fixated on declines in inflation, which are about to happen or are already happening. 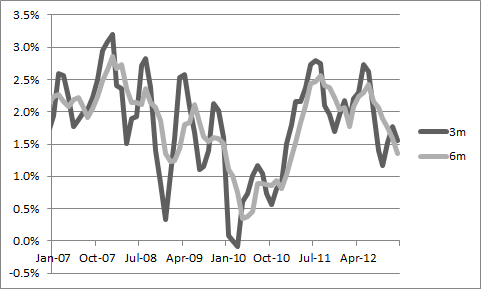 Have a look at the momentum in US core inflation (below, annualised rates). There is almost nothing worrying about this picture unless of course you are a firm believer in the “what goes down, must go up” theory. In all likelihood the US inflation picture will not change in the coming months, particularly in the core. But what about the rest of the world? Let’s not forget that vast majority of economies have experienced a significant drop in potential growth rates over the last couple of years. This means that any increase in growth could lead to inflation sooner than we think. Sure, many will say that it’s not just the growth rate that matters and we need to close the output gap first but the worry is that the world where productivity is on the decline any growth acceleration could be inflationary. Add to that a sustained supply shock and you have a recipe for a pretty decent repricing of interest rate expectations. Where does this leave us? Improving leading indicators, lower potential GDP growth rates, reduced productivity growth and possibly quite persistent upward trend in oil prices. For me these are crucial reasons to worry about bond markets in many (emerging) economies. In my mind they are certainly more valid than the US Treasury sell-off cliche, which dominates media and analysis. How to trade this? 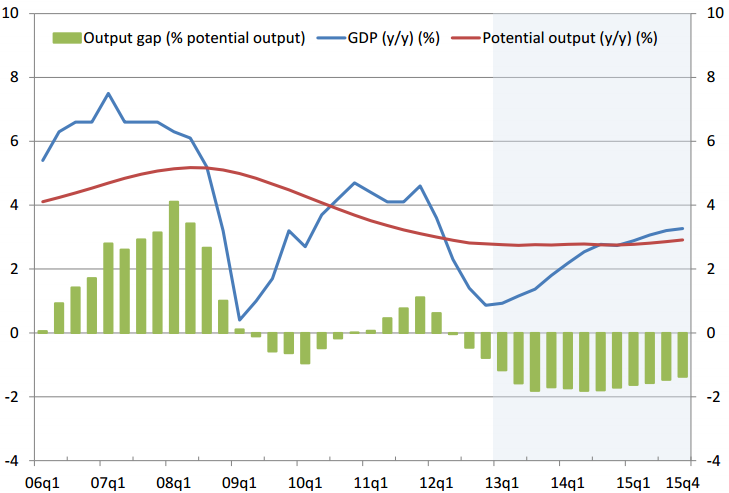 Find a country with a significant trade deficit and improving growth outlook (e.g. Turkey) and be defensive there. Also, look for activist central banks (e.g. Israel) and be aware that those guys can and will move very quickly. Additionally, if you need to own bonds, go for short duration in higher yielders (such as Russia or Brazil). Finally, think if it doesn’t make sense to switch out of suppliers or industrial materials into energy producers – this could be a very long term trend, unless of course someone comes up with a car that runs on water. And by the way, I would like to wish that last bit to all of you (unless you’re a Russian oligarch).